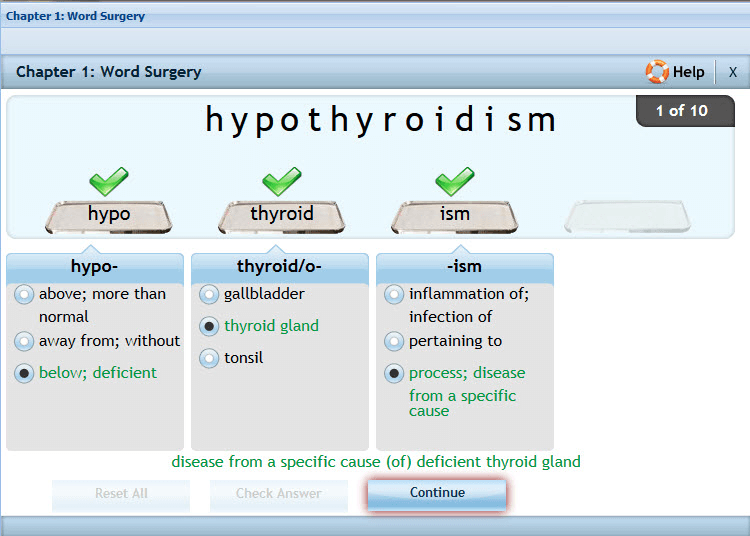 See how MyLab Medical Terminology helps you master key concepts and improve results. Being fluent in a language means being able to read, write, and converse clearly and accurately. With Med Term Speak & Spell, we take the same approach to learning medical terminology—the foundational building block of a safe, successful career in healthcare. You can interact with Speak & Spell in various ways — from viewing an associated image and hearing the pronunciation, to recording and playing back your own pronunciation. You can repeat these exercises as many times as you’d like. Dynamic Study Modules use the latest developments in cognitive science to help you study chapter topics by adapting to your performance in real time. As a result, you build the confidence needed to deepen understanding, participate meaningfully, and perform better — in and out of class. Having trouble watching the video? Read the transcript. Learn more and download the free app at the iTunes® Store or Google Play™ store. Please note, the Dynamic Study Modules app is meant to be used in conjunction with MyLab Medical Terminology. Ask your instructor if MyLab Medical Terminology is part of your medical terminology course. 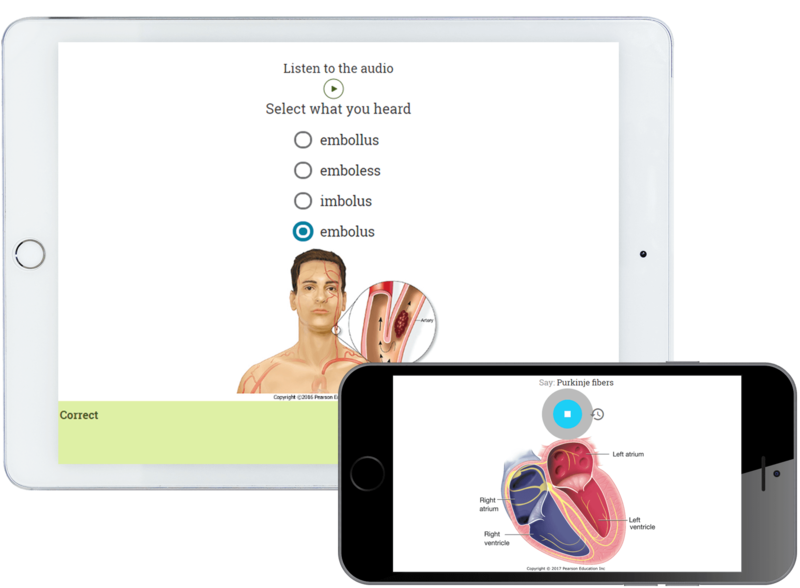 Have fun learning medical terminology with our interactive study games. Take a break from reading, and use these engaging games to test your knowledge of the terms in each chapter. Pearson eText is a simple-to-use, personalized reading experience available within MyLab. You can use your computer or the mobile app to easily highlight and take notes all in one place — even when offline.  Seamlessly integrated videos and rich media* give you access to the help you need, when you need it. Do you learn by listening? Listen to our text-specific Guided Lectures to prepare for class, review material after class, or reinforce your pronunciation of medical terms. Use the outline view to quickly navigate to a particular slide, or switch to the notes view for a complete transcript of the lecture. The homework and practice exercises in MyLab are correlated to the exercises in the textbook, and they generate algorithmically to give you unlimited opportunity for practice and mastery. Exercises include guided solutions, sample problems, and learning aids for extra help at point-of-use. If you answer incorrectly, you'll receive helpful feedback. Ever wondered where you might need the most help in class? MyLab generates a personalized Study Plan for you based on your test results, which links directly to interactive, tutorial exercises for topics where you need the most help. These exercises provide unlimited practice and include guided solutions and multimedia learning aids to give you additional help.